16A 80 Galbraith Drive SW - SOLD! Great condo in desirable location in mature Glamorgan. 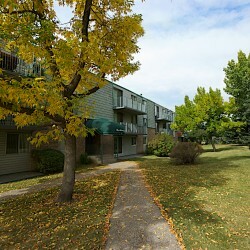 Walk to Mount Royal University, transit, shopping yet easy convenience to everywhere via Glenmore Trail. This "top floor" 2 bedroom condo faces the park side and is surrounded by trees which provide privacy. Pleasantly painted in neutral tones with newer laminate flooring. This condo offers 2 large bedrooms, lots of closet and storage space, full bath, in suite laundry with some storage in addition to an assigned storage locker. Large and bright living room with a view of park and trees, large dining room to entertain and a walk through galley style kitchen. This is a great condo for first time home buyers with a fabulous location.